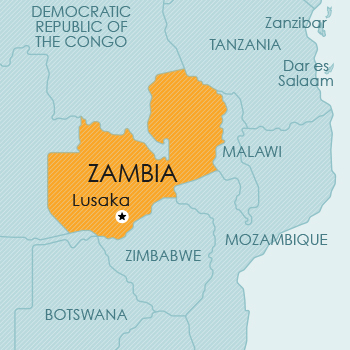 Zambia, an independent republic, is a landlocked country in southern central Africa, bordered to the north by Democratic Republic of Congo and Tanzania; to the east by Malawi and Mozambique; to the south by Zimbabwe, Botswana and Namibia, and to the west by Angola. Imports: Machinery; transportation equipment; foodstuffs; fuel; petroleum products; electricity; fertilizer; clothing. Zambia is a member of the Paris Convention, the Madrid Protocol, and the WTO/TRIPS. Although Zambia is also a member of ARIPO, it has not acceded to the Banjul Protocol of ARIPO. Trade mark applications may be filed as national applications, in appropriate circumstances claiming convention priority in terms of the Paris Convention. Although Zambia is a member state of ARIPO, it has not acceded to the Banjul Protocol and has thus not enacted enabling legislation for the local recognition and protection of ARIPO trade mark registrations. Provision is made for the registration of trade marks in respect of goods, either in Part A or Part B of the register, and for the registration of certification marks in Part C of the register. Defensive marks may be registered in Part D of the register. Zambia is a member of the Paris Convention, ARIPO (Harare Protocol), the PCT and the WTO/TRIPS. Patent protection is obtainable by way of a patent granted on a national filing or a regional filing through ARIPO. A patent is granted in respect of an invention which entails patentable subject matter. Although Zambia has also acceded to PCT, specific provisions to implement the filing and prosecution of PCT applications have not yet been introduced into the Act. However, the Act contains a general provision which empowers the Minister to make regulations, by statutory instrument, for securing that a patent application made in accordance with an agreement by the Zambian Government with another country shall not be prejudiced. It is possible that this provision may be used to deal with PCT applications. Zambia is a member of the Paris Convention, ARIPO (Harare Protocol), and the WTO/TRIPS. Design protection is available by a national filing or via an ARIPO application designating Zambia. Zambia has implemented the Harare Protocol (which regulates patent and design filings in ARIPO) in its national law, thereby giving valid design protection to applicants seeking to obtain a design registration via ARIPO. Zambia is a member of the Berne Convention and the WTO/TRIPS. typographical arrangements of published editions. Literary works are further defined to include dramatic works and arrangements of information in tabular form. Zambia is not yet a member of the UPOV Convention for the protection of new varieties of plants. The effect of protection by way of a plant breeder’s right is that the holder (or his licensee) has the exclusive right to act in relation to propagating material of the variety, such as produce/reproduce the material, offer the material for sale, etc.